If you asked my mom, she'd tell you that I hate history. that's not really the case; I just care about a different kind of history. It's true that I'm not particularly interested in reading about wars, politics, architecture, or genetics. I'm not really invested in biology, weather, geology or how those sciences have evolved. But if you ask me about media history or the evolution of social politics - I'm there. 100%. I very much care how we relate to, and understand history through media. I like to say that I'm interested in "relational history." On that note, I'd now like to rant about movie remakes. People generally congregate in two camps: remake haters and remake enthusiasts. On the surface, I am a remake hater. But, I am also an elitist film snob with an obsession for understanding how things work. I hate remakes because people watch them in a vacuum, disregarding the fact that there is a history behind them. The average movie-goers latch onto the remake without realizing that many films were influential to media history (and by the culture of the time) when they came out and newer editions lose that importance. Remakes allow uneducated people to continue being uneducated. Remakes encourage the ever-growing societal consumption that completely disregards origins, history, and the cultural context within which a film was made. But it's not just the audience; technology has made media entertainment increasingly easy to create and to view. The sheer quantity of media entertainment is exponentially growing while people's perception of media has changed to a more "disposable" concept. This idea that movies are "fast food of the mind" means people often forget the social commentary aspects from the original films. I have a particular dislike of horror remakes where social commentary is especially strong: the slasher / psycho killer movies of the 80's spoke heavily of a distaste for consumerism, a failing in adults in their ability to raise, communicate with, and respect children. (Look at Nightmare on Elm Street). 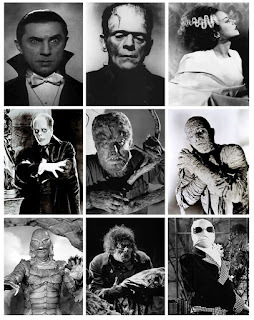 Or the Universal Monsters - classic, distinctive, unparalleled. Shaping, not only horror cinema, but a generation's outlook on monsters and their relationship to humanity, the Universal Monster Movies stand among the greatest films of all time. Over the years, there have been numerous remakes, re-tellings, and re-imaginings of these movies. Their continued popularity due, in part, to the immense amounts of tenderness and sympathetic nature in each of the creatures. Perhaps due to evolving technologies and perhaps due to changing societal views, that tenderness and humanity has evaporated leaving behind scraps of stories and character names with very little feeling behind them. On the other hand...There exists an idea that there are ONLY two stories in the world : a traveler goes on a journey and a stranger comes to town. Now, if you're following along here, that's actually only one story told from two different sides. If we accept that there's only one story to be told then remakes are completely unavoidable. So then, what's the point in complaining about them, right? Can't change it. Can't stop it. Why not embrace it? A remake can breathe new life into a genre that may be dying out. Genres ebb and flow with the changes in society; the things we need to escape from change and so our movies change. A remake can bring new focus to great stories that are being lost in the shuffle and provides younger audiences a chance to see movies they probably won't watch. Think about Dracula: a great story about love, obsession, religion, science, sexuality, and disease. Important, timeless topics. But even being the horror buff that I am, when I was a kid I didn't want to watching a boring, old, black and white movie. And look at how many times Dracula has made his way into the movies over the years. Clearly a story worth telling, clearly a story that needs a time appropriate "skin" to get noticed. A successful remake generates the needed revenue to keep movies being made. Love horror? Hate horror remakes? We're in the same boat but lets face it: if we want to keep seeing horror movies, horror movies need to be successful at the box office. Alright - wrap up time. I will always look down my nose at remakes of movies I know are great. That's my way. But please don't let me stop you from going out and filling your brain with crappy movies.